This is a popular salad that goes by many different names: Ramen Cabbage Salad, Chinese Coleslaw, etc. It doesn't matter what you call it. It matters that you make it. Just this week I entered this family-favorite salad in our staff cook-out contest. And I won!!! I was so excited to win. And today, one of the judges told me he rated this salad a "6" - on a 5 point scale! It's that good. This salad is simple to put together, and travels well in its separate parts. First, crush the Ramen noodles. I do this without opening the package, and just use the heel of my hand. 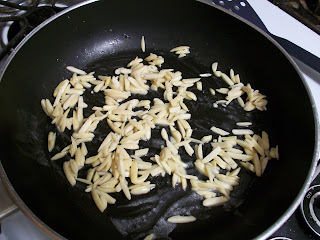 Next, toast the almonds in a bit of butter on the stovetop. You can also toast almonds in the microwave, or in the oven. I prefer the stovetop. 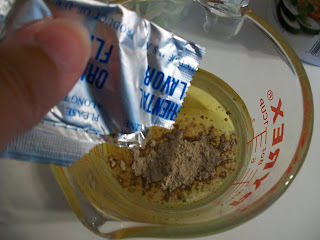 If you like, you can also add the crushed ramen noodles to the almonds, to toast them also. This is not necessary, but I did it this time, pulling out all my tricks to try to win the cookout contest! While the ramen and almond mixture cools, assemble the salad and the dressing. And try not to eat all the ramen noodles and almonds. 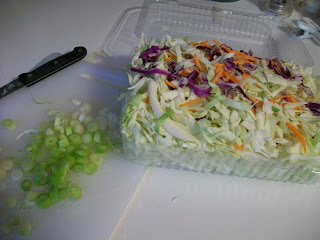 Slice the green onions, and combine them with the coleslaw in a salad bowl. Dole makes a nice coleslaw mix, and my grocery store also makes it and sells it in packages, already shredded (as pictured above). If you like, you can make your own coleslaw mix from "scratch" using cabbage and carrots. Finally, for the dressing, combine the oil, vinegar, sugar, salt, pepper and 1/2 of the seasoning packet from a package of Oriental flavored Ramen noodles. Whisk well to combine and until sugar is dissolved. The salad needs to be dressed immediately before serving. 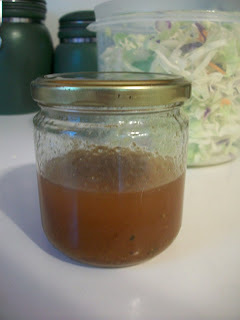 If you're not serving this right away, you can transfer the dressing to the jar to easily transport it. 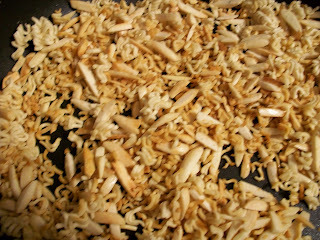 If you're serving immediately, toss the salad with the dressing and then stir in the almonds and noodles. If you're taking it somewhere, take the salad, noodles/almonds, and dressing in separate containers and then assemble the salad right before serving it. Need more cabbage ideas? Check out the In Season Recipe Swap. There are more recipes at Tempt my Tummy Tuesday, Tasty Tuesday, and Tuesdays at the Table, What's Cooking Wednesday , Blissfully Domestic, Family Recipe Friday and Friday Feasts. Don't forget to check out the Eat More Fruits and Veggies Challenge, too and the 4th of July edition of Tasty Thursday. Combine the dressing ingredients and whisk well to dissolve sugar. In a large salad bowl, combine the coleslaw, green onions, almonds, and ramen noodles. Drizzle dressing over and toss well to combine. Serve immediately. This really does look and sound great. Thanks for the recipe and linking to TMTT. This is one of my families favorite recipes! I have used the Ramen Noodles in Broccoli Slaw and it is really good. I am going to try it with the Coleslaw next. This dish looks so good ~ I will be giving the recipe a try real soon! 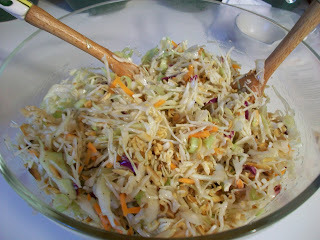 I have a similar recipe.Asian slaw is so good!Thanks for sharing this recipe! I have a similar recipe too!But I think yours is easier and sounds really delicious. I'm definitely going to give this a try. Looks yummy! This looks absolutely ymmy - definitely adding it to my summer recipe collection! I hope you'll join me again this Friday for another Favorite Ingredients Friday! am making salad now !!! Just made this with some Chicken Fried Rice and Egg Rolls for dinner. It is Yummy!!! Definately adding this to my list of things to have on the menu!! I did change it up a bit...Instead of Canola, I used Veggie. 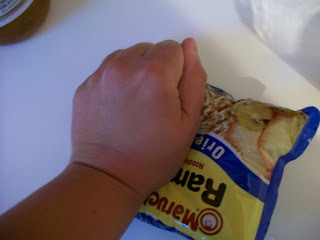 Instead of Cider Vinegar, I used Rice Vinegar.Instead of Oriental, I used Chicken flavored noodles. Definitely need to roast the almonds & noodles! Try not to eat them all! LoL! Hard task!! Thank you!! A must have on the menu!! This tastes MUCH better if you put the dressing on and allow the flavor to blend with the coleslaw. Refrigerate for a few hours. Toss with the other ingredients before serving.